Dohrn Trading is proudly recongized by the German National State as an Authorized Economic Operator. 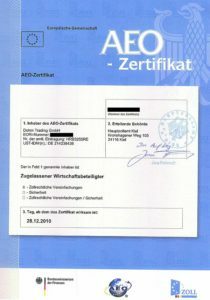 The AEO certificate was handed out by head-customs office in Kiel, capitol of the German County Schleswig-Holstein. 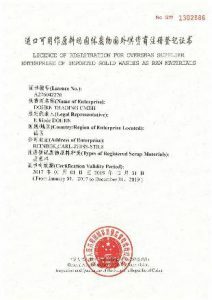 From 01/01 2005 until 12/31/2016, Dohrn Trading is AQSIQ approved by the General Administration of Quality Supervision, Inspection and Quarantine of the People’s Repulic of China. This further demonstrates our continuous commitment to highest standards of administrative processes as well as to utmost quality of our service delivery.